Seeds, and thereby food crops are at the very centre of a nation’s survival. It is no wonder then that corporations and governments have been trying for decades to control seeds. India as a nation has fought against the entry of Genetically Modified (GM) food in the form of food aid from USA back in 2002. Then in 2010, following an uproar by scientists, academics, states, questioning the gaping holes in regulation, science and questioning the very need of the crop, Mr. Jairam Ramesh, the then Minister of Environment and Forests announced an indefinite moratorium on Bt brinjal a Mahyco/Monsanto product. Later in 2012, the Supreme Court’s Technical Expert Committee’s strongly recommended a 10 year moratorium on large scale field trials and thereby commercialization of any GMOs in the country. The 31 member cross party Parliamentary Standing Committee on Agriculture also expressed serious reservations on GMOs pointing to gaping holes in regulation, growing science against GMOs, and suggesting that alternatives be considered first. Yet, once every few years Government after Government tries to push GMOs through a broken regulatory system that cannot protect its own people. And usually, in a very secretive manner. Bt Cotton is so far the only GM crop that’s grown in India. However, its success has been limited to geography and chronology. It has only managed to work in irrigated areas, which is just a one-third of the total land under agriculture, and has been a disaster for the rain-fed areas. The increase in yield could also be attributed to the hybridization process. Bollworms, the key pest against which Bt was engineered, grew resistant to it within a few years. To make matter worse, secondary pests like whitefly, which were non-threatening in the past, are now wiping out entire regions of Bt Cotton. This year, organic cotton farms in Punjab were like oases of prosperity amidst large scale despair. With the recent ban on cultivation of GM crops by 17 European countries and four regions in two other EU countries, the resistance to this unsustainable technology is getting stronger across the world. Emergence of Superweeds in USA has rendered a large chunk of land under this technology unusable. Trade restrictions on GM crops have resulted in loss of billions of dollars for American farmers when China rejected their consignments of corn contaminated by unauthorised genes. For the bureaucracy and the government to still walk this line when we have our own wealth of ecological agriculture wisdom to share with the world, is indeed grave news for farmers and people. GM Mustard, the research for which is funded by Dhara Oils and done by Delhi University is the latest entrant to the debate. This GM Mustard (DHM11) is Herbicide Resistant to Glufosinate, a herbicide produced by Bayer. This implies that this herbicide can be sprayed without check to kill weeds, posing a grave risk to us consumers as it is highly persistent and labeled as “high risk to mammals” by the European Food Safety Authority (EFSA 2005). The chemical is not easily destroyed by cooking the food item in boiling water. The rise in productivity, which is being attributed to DHM11 is essentially a result of the hybridization process and has no relation with genetic modification. A non-GM hybrid has the same yield levels without the risk posed by genetic engineering. Thus, the only group it benefits is the seed companies and corporations like Bayer who will see a spike in their profits at the farmer’s cost. 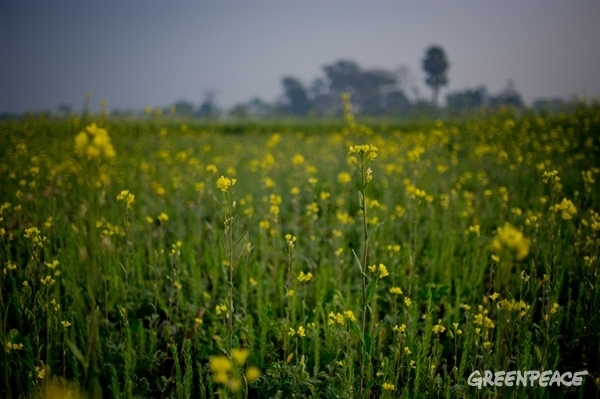 The states where 70% of mustard in India is grown have refused to field test this variety. Careless monitoring and contamination reports were cited at the trial sites. Dr. Deepak Pental, the developer, told journalists from Down To Earth that “it is wrong to claim that transgenes won’t move to non-transgenic material. If you have a selection over it like a herbicide, then they spread very quickly.” Even the farmers who chose to grow non-GM, will be left helpless in the face of contamination. The yield is comparable to many safe high-yielding non-GM varieties with no added production benefits. Even at such an advanced research stage the biosafety data, which gives an indication of the safety of product for consumption is being denied to public. And now we hear everywhere the reports of its impending commercialisation without even a guarantee for our people’s own safety. Is it government’s apathy towards people who voted it to power or a verdict of our inefficient and corrupt bureaucratic system? Either way it’s enough to shake up anyone who still cares for their food and cherishes sarson ka saag, saag ghosht, mustard oil and seasoning in our favourite curries.